Published: Apr 8, 2019 · Modified: Apr 11, 2019 · By Jen Sobjack · This post may contain affiliate links. 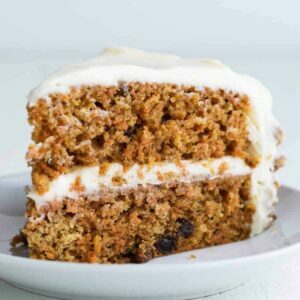 Loads of shredded carrots, raisins, and warm spices make this moist carrot cake the ultimate treat. It’s easy to make and tastes amazing with silky cream cheese frosting. Carrot cake immediately comes to mind when I think of Easter and spring recipes. The flavor and texture are insanely good and the cream cheese frosting pairs so perfectly. 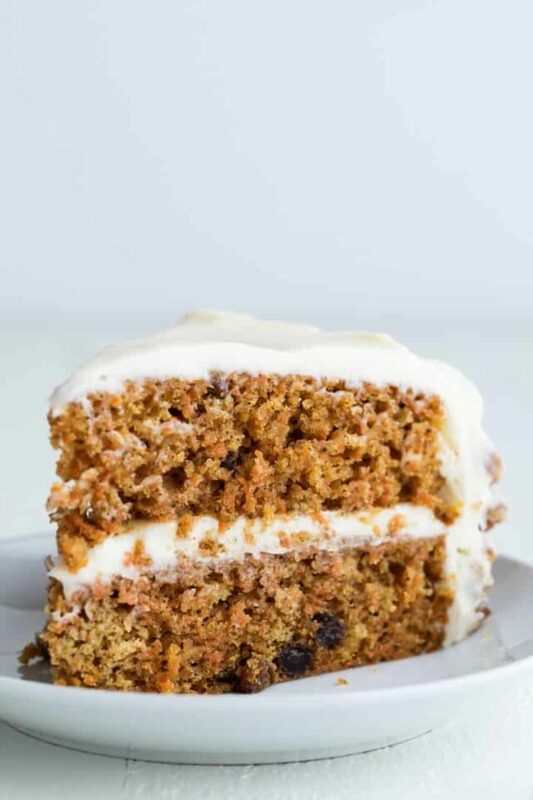 Are you a fan of carrot cake? 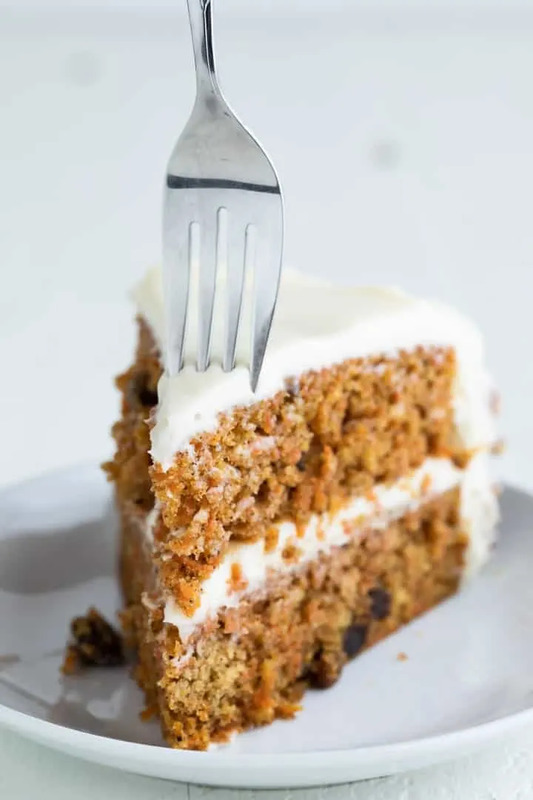 I’ve shared the ultimate pineapple carrot cake before and today’s version is just as moist and flavorful. There are more carrots in today’s cake and the spices are slightly different. 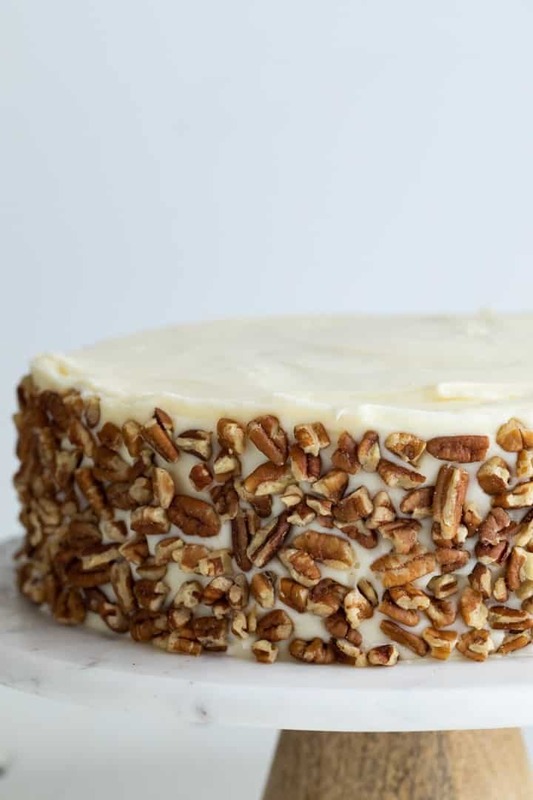 The cake is covered in my favorite cream cheese frosting and decorated with chopped pecans. You can skip the nuts if you wish or use something else like walnuts. The carrots are shredded with a grater so they are finer in texture as opposed to using a mandoline. 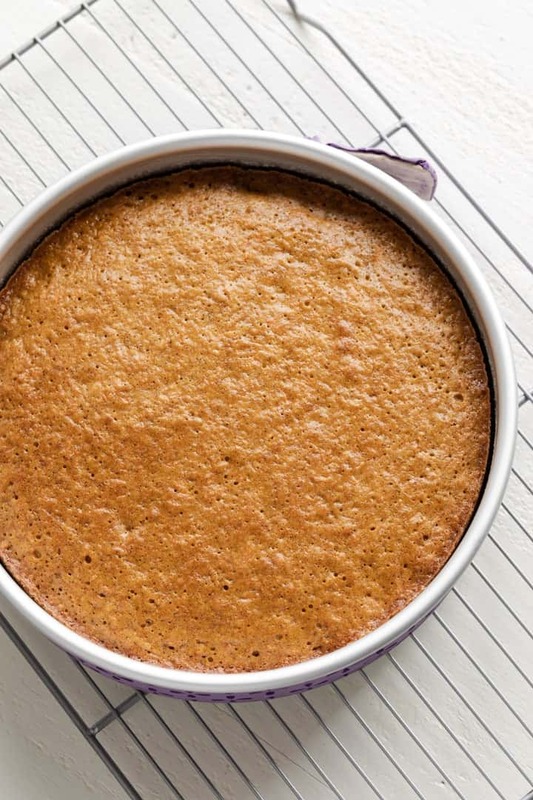 Greek yogurt is used to help keep the cake moist. Oil is used instead of butter which also adds to the moisture of the cake. The Cake Batter – The batter is super simple to prepare. It doesn’t require a mixer like my vanilla cake, white cake, or chocolate cake. All you need is a whisk and a large mixing bowl. Let go over the steps. The Frosting – I used my favorite cream cheese frosting with one small change to make sure the frosting wasn’t too soft for a two layer cake. Prepare the cake pans. Lightly grease and flour two 9-inch cake pans and line the bottoms with parchment paper. The parchment paper will ensure the cake doesn’t stick to the pan. Make the batter. Use a whisk to stir brown sugar, granulated sugar, oil, Greek yogurt, eggs, and vanilla together. Stir in finely shredded carrots and raisins. Then sift flour, baking powder, baking soda, cinnamon, nutmeg, salt, and cloves into the batter. Stir it until everything is just combined. 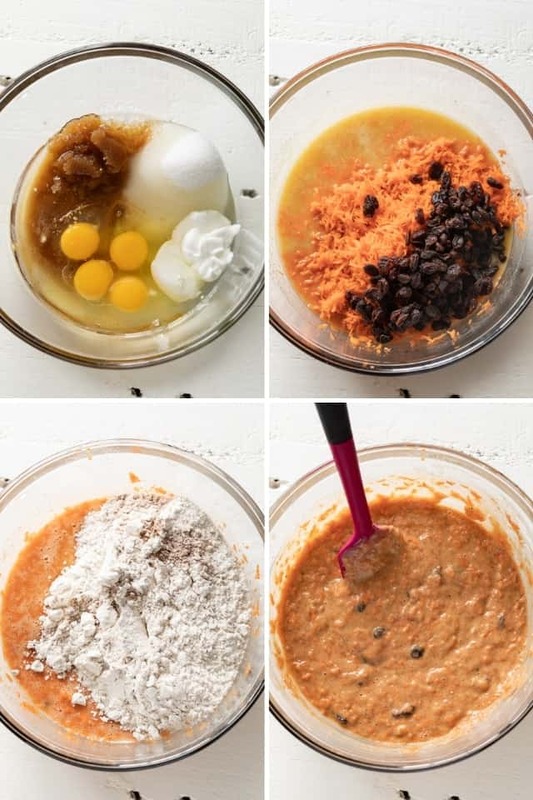 Steps for how to make moist carrot cake. Bake. Divide the batter evenly between the two pans and bake for 20-25 minutes or until a toothpick inserted into the center comes out clean. Make the frosting. Beat cream cheese and butter together until smooth and creamy. Beat in confectioners’ sugar, meringue powder, vanilla, and salt until well combined. Meringue powder helps thicken cream cheese frosting so it won’t seep out between cake layers. Frost the cake. Once the cake layers have cooled, place one of the layers on a serving platter and cover the top with frosting. Set the second layer over the top then cover the entire cake with frosting. Garnish if desired. If you like pecans or walnuts, coursley chop about 1/2 cup and press them into the sides of the cake. Refrigerate. Refrigerate the assembled cake for 1 hour before slicing and serving. This will set the frosting and make the cake easier to slice neatly. 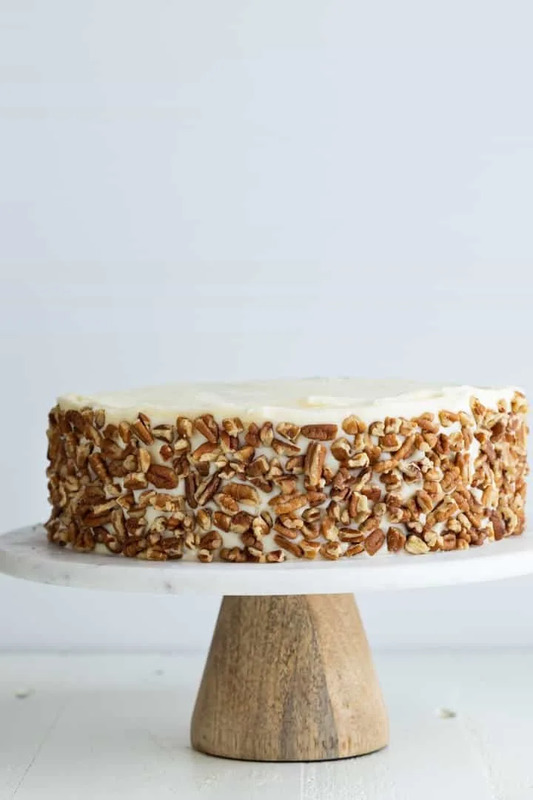 How to store carrot cake? Keep carrot cake in the refrigerator for up to 5 days. Alternatively, the cake can be frozen for up to 3 months. What’s the best way to shred fresh carrots? I like to use a box grater to shred carrots. Wash and peel them before shredding. Avoid buying pre-shredded carrots from the grocery store. They are too thick and too dry for carrot cake. What else can I make with shredded carrots? If you have leftover shredded carrots to use up, try making my carrot cake scones. They are almost better than cake! Adjust the oven rack to the center of the oven and preheat to 350ºF. Lightly grease and flour 2 9-inch round cake pans and line the bottom with parchment paper cut into a circle. Sift the flour, baking powder, baking soda, cinnamon, nutmeg, salt, and cloves together in a large bowl. Whisk the sugars, oil, yogurt, eggs, and vanilla together in a second large bowl. Stir in the carrots and raisins. Add the flour mixture and fold everything together until just combined. Divide the batter between the prepared pans and smooth the top with an offset spatula. Bake for 25-30 minutes, until a toothpick inserted into the center comes out clean. Cool the cakes in the pan for 5 minutes then invert them onto a wire rack and allow them to cool completely before frosting. In the bowl of a stand mixer fitted with the paddle attachment or with a handheld electric mixer, beat the cream cheese and butter together until smooth and creamy. Add the sugar, meringue powder, vanilla, and salt. Beat on low until just incorporated then turn the mixer to high speed and beat for about 1 minute until everything is well combined. Place one layer on a serving platter. Spread about 1/3 of the frosting over the top. Gently place the second layer on top of the frosting. Spread remaining frosting over the top and sides of the cake. Garnish with toasted pecans if desired. Refrigerate the cake for at least 1 hour before serving. The cake can be refrigerated for up to 24 hours before serving. Bring to room temperature before slicing. The cake layers can be made ahead 1 day in advance. Wrap on plastic wrap and store at room temperature or in the refrigerator. The frosting can also be made 1 day in advance. Cover and store in the refrigerator until ready to use. The frosted or unfrosted cake can be frozen up to 3 months. Thaw in the refrigerator overnight. Make sure to measure the flour correctly so the cake stays moist. Sour cream can be used in place of Greek yogurt. Avoid using storebought shredded carrots. They are too dry and thick. Instead, use a box grater to shred fresh carrots that have been washed and peeled. That’s fantastic, Christina! I’m so happy you enjoyed it! I do have one question; if my grocery store doesn’t carry meringue powder, should I use egg whites instead? And if so, how many? You can order it Amazon or just leave it out. Thanks so much! I did see your link to Amazon last week and ordered some, and am about to make mine this very moment. I will leave feedback later! The following is from Fine Cooking magazine. That statement stands true for the types of recipes it’s referring to. This is a recipe for carrot cake with cream cheese frosting, not pavlova, royal icing, or seven-minute frosting which require egg whites. Egg whites are not required for buttercream or cream cheese frosting but meringue powder works great for thickening these two types of frosting. This carrot cake really is so moist! My family loved it.